We are anchored off of Key Biscayne right near President Nixon’s old house. Actually his old house was torn down in 2004, but we’re near where it was. It was another great day of sailing. We sailed along at over 6 knots the whole day with the winds just forward of the beam. As we got closer to Key Biscayne our course became more northerly and the winds actually shifted to keep them on the beam. Perhaps the wind gods read my earlier post and decided to make up. The cat has been hit by some sea spray and now he has some spiked hair. He hasn’t tried to clean it up, I guess like may sailors he isn’t too concerned about his appearance until he gets to port. We had another mechanical problem. We developed a leak in an exhaust hose fitting. Let me say this about that – do not take a metal male fitting and screw it into a female pvc fitting. Nothing good will come of it. It may not be today or tomorrow, but at some point a yard monkey will over tighten it and crack the pvc or the metal threads will work against the plastic threads and chew them up. The fitting still drips some, but with hose clamps and safety wire it should last until we get to Vero Beach and I can make a proper repair. 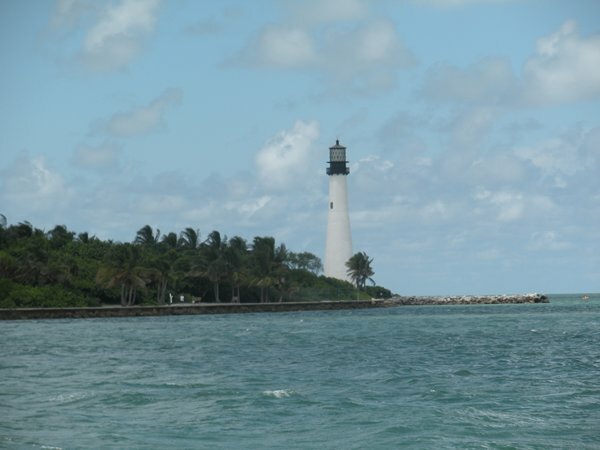 Here is a picture of the Key Biscayne light house. This is the only decent picture we took as we entered because we were concerned about exhaust leak. Hopefully we’ll get some more on the way out.